I stumbled into Facebook's secret brain and learned how it really sees me. 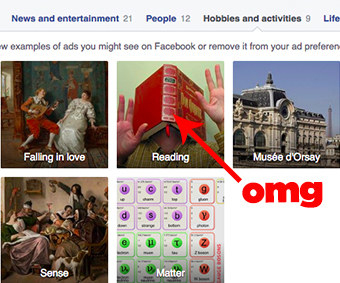 I was poking around Facebook's privacy settings – when I accidentally discovered the site's ad preferences page. It offers a glimpse into the wild, often bizarre things Facebook's robot mind thinks you're interested in, based on years' worth of information you may not have realized you've been feeding it. In my case, that includes blankets and carbohydrates which is *pretty* accurate, tbh. And then I asked my colleagues to share what they see. The data seems so personal, so weirdly specific – and yet, so wrong?! QQ: should I be worried that my boss is into the Middle Ages? Here's a portrait of a v hip and cultured business reporter. Gastropod shells are so ~in~ right now. Also, walls. And an editor who studied abroad in France one time. These THUMBS can't be made up you guys. 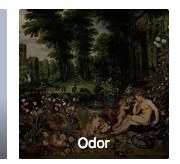 Odor seems like a fun hobby. One of the more intriguing things is seeing how Facebook thinks you lean politically. Even if you haven't explicitly posted to Facebook, "I LOVE BERNIE SANDERS" – other non-political pages you interact with may determine how Facebook defines your political inclinations. For example, as The New York Times explains, if you "like" Ben and Jerry's and a lot of other liberal Facebook users do too, then Facebook is more likely to group you into that bucket. How the heck does Facebook come up with this stuff? According to Facebook, the pages you like, the posts you comment on, and the information on your profile all help their algorithm figure out which ads you're most likely to respond to. Stores use this tool to show you an ad on your Facebook newsfeed for the pair of shoes you looked at yesterday on an entirely different site. It's how Facebook knows you're in the market for a bike, even though you didn't tell it you were interested in cycling. The pixel embedded in a site's code lets Facebook know when and if you've ever viewed that web page, made a purchase from that site, or downloaded that company's mobile app. It can also tell advertisers who want to sell you stuff that you only buy when you're on a desktop computer versus your phone, for example. Any page that has a Facebook "Like" button installed most likely uses a Facebook pixel. Even pages that don't have a "Like" button can have a pixel installed. This means it's possible that Facebook knows most of your web browsing history. All of Facebook's companies, including WhatsApp, Oculus, and Instagram, see the data collected by pixels. The Ad settings page is a good place to start. Here, you can set whether or not you want to see ads based on your interests. You can also turn off ads based on information collected off of Facebook's websites with pixels. From the Ads settings page, go to Ads based on my preferences > Manage the preferences we use to show you ads > Visit Ad preferences. On the ad preferences page, you’ll be able to see what Facebook *thinks* your interests are and remove the interests that aren't accurate. So, how does Facebook's secret brain see *you*?